A Place for Kia: Adulting Done! Today I am playing along with the Inspiration Challenge at Splitcoastampers, where we have had a visit to a fun store called SNURK. I took my inspiration from this mermaid duvet cover. 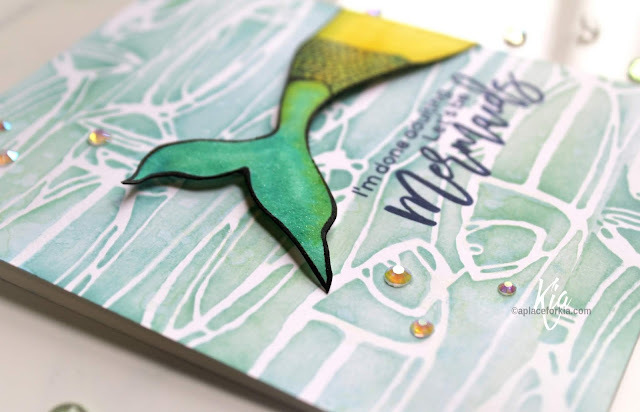 I thought it the perfect opportunity to use my new Mermaid stamp set from Picket Fence Studios and my Fish Stencil. I first did the background on my card base using A Colorful Life Stencil Primitive Fish. I brushed on the ink using Distress Oxide Inks in Broken China and Cracked Pistachio, then splattered with water, drying with a paper towel. 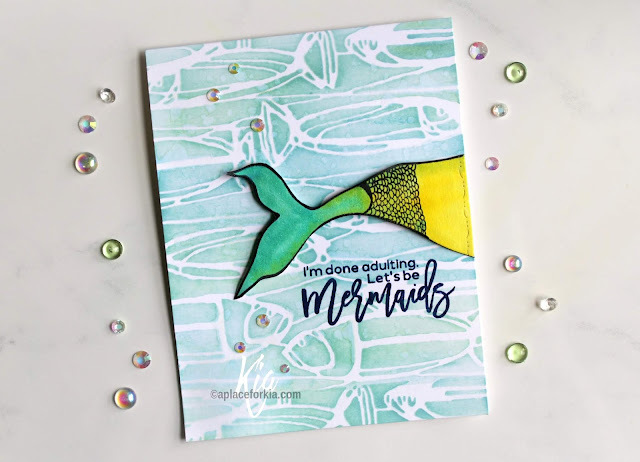 In my Misti I stamped the Mermaid using Ranger Archival Ink in Jet black on watercolour paper and proceeded to watercolour with Distress Oxide Inks in Mustard Seed, Mowed Lawn and Mermaid Lagoon. 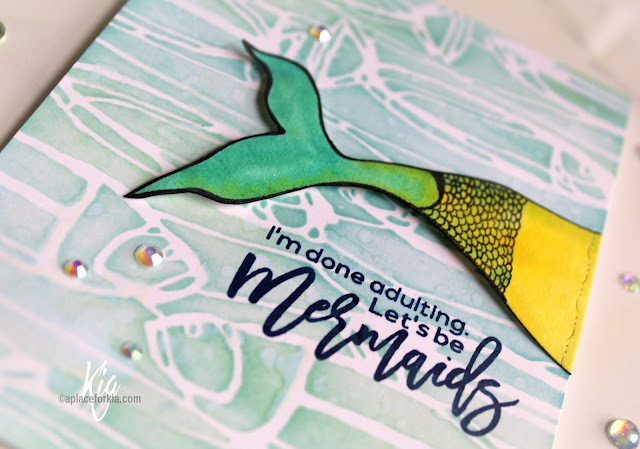 Once dry I fussy cut the tail, then ran the piece through my Gemini Jr. using Penny Black's Elegant Stitching die to add a bit of detai on Mermaid Tail, then attached the Mermaid with Nuvo glue along the edge, and foam squares for the rest of the tail. 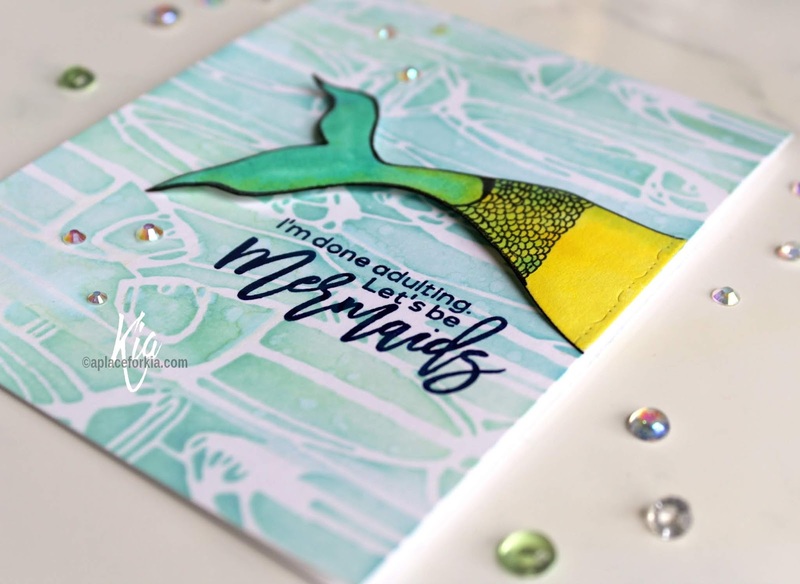 To finish, in my Misti I stamped the sentiment using Ranger Archival Ink in Cobalt and added several Iridescent Crystal Gems. I hope you have enjoyed this card, and wish to thank you for visiting. Following are affiliate links for both USA and Canada, when available.